Before the game, I took another crack at the “raster-like” CNC photo-engraving this weekend. In my first attempt described in a previous post I got less than satisfactory results by using about a 30-degree angle V-bit in the CNC (engraving on right side of photo above). There just wasn’t enough change in width of the V-bit as it advanced deeper into the wood to show the carving relief needed to make the image visible. For this second try, I used a 90-degree angle V-bit (made by Proxxon) because I couldn’t find a 60-degree bit from my usual sources. 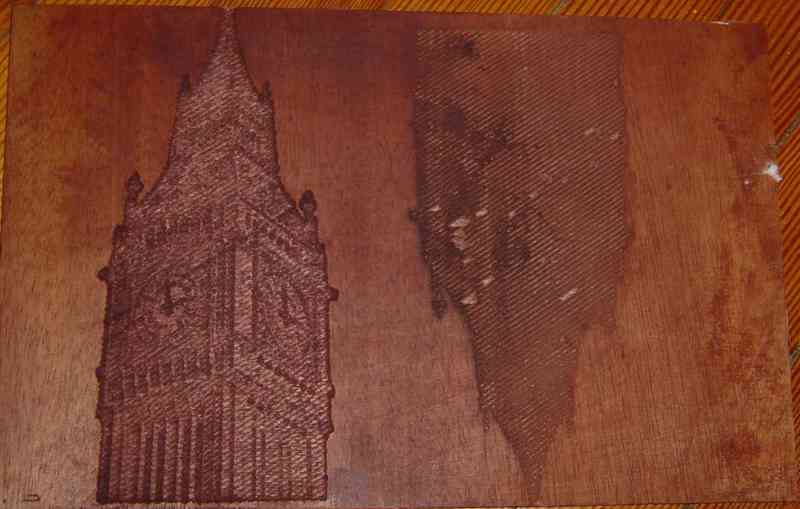 The 90-degree bit worked MUCH better and the image is very legible in the wood (engraving on left side of photo above). I think some of the detail of the image was lost because a 90-degree bit is too wide for this application, but it was a big improvement. It looks to me like 60-degrees would be perfect, but I can’t find anyone yet that makes a 1/8″ shaft bit with a 60-degree angle. This is going to take some Internet research. Posted on February 6, 2006, in CNC. Bookmark the permalink. Comments Off on Second attempt at a “raster-like” CNC photo-engraving.